Skylark Contour 150-Watt Single Pole/3-Way LED/CFL Dimmer, Brown The Contour dimmer provides optimal dimming performance of LED bulbs. This dimmer works with up to 150 Watts of dimmable LED/CFL or 600 Watts of incandescent/halogen, allowing you to control multiple bulb types on the same circuit. It is designed to control a broad range of dimmable LED and CFL bulbs from a variety of brands including Philips, Cree, GE, EcoSmart and Lighting Science. The Contour dimmer features a smooth slide, captive knob to adjust your light to any activity. Use the rocker switch to turn your lights off or on---returning the lights to your favorite level. Coordinating Claro wall plate sold separately. 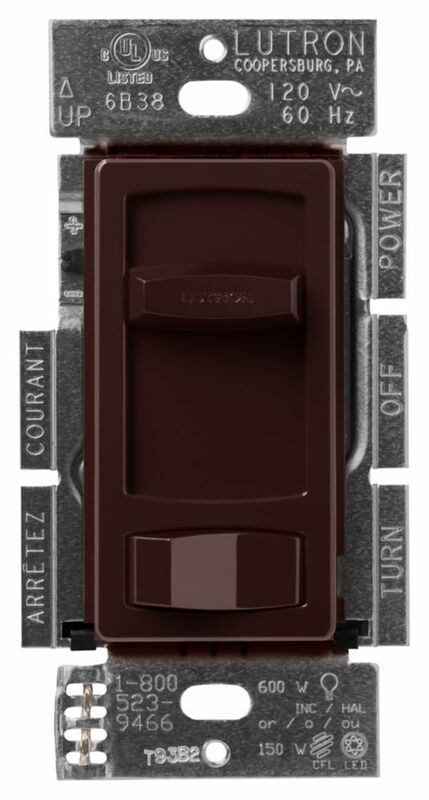 Skylark Contour 150-Watt Single Pole/3-Way LED/CFL Dimmer, Brown is rated 4.6 out of 5 by 18. Rated 5 out of 5 by Shawn from Very Good Quality and easy to install.... Very Good Quality and easy to install. Rated 5 out of 5 by Dooley from Works great with the 6 LED can lights we put... Works great with the 6 LED can lights we put in. We had fluorescents before which of course are not dimmable so this is a nice upgrade. Rated 5 out of 5 by MJinFla from I ordered these dimmers for LED tape lighting on built-in... I ordered these dimmers for LED tape lighting on built-in office cabinetry. The brown color blends with the cabinet finish and is a perfect designer finishing touch. Rated 4 out of 5 by Delfino from Works great. Feels a little flimsy and would be nice if it dimmed a little bit more. Overall a ... Works great. Feels a little flimsy and would be nice if it dimmed a little bit more. Overall a big improvement.